Blue Origin recently launched and landed its first New Shepard rocket of the year. This is a significant milestone for a program that has promised to take passengers into space by the end of 2019. The New Shepard is a fully reusable rocket—which means that, after each flight, every part of the system is recovered for later flights. It consists of two main parts: a rocket booster and a crew capsule. During each launch the booster powers the rocket through the atmosphere, delivering the capsule to the edge of space, about 62 miles above ground. At this height, the booster separates from the capsule—which will give future passengers the sensation of weightlessness. Shortly afterward, the booster and the capsule both fall back to Earth: the booster reignites its engines to orient itself and land upright while the capsule uses three parachutes to float to the ground. Blue Origin NS-10: New Shepard launch and landing. The January mission, named NS-10, is part of a series of uncrewed test flights designed to prepare the rocket for passenger flights. It is the rocket’s fourth launch from Blue Origin’s West Texas test facility—and, encouragingly, it has landed successfully every time. Blue Origin says it will introduce a more advanced New Shepard vehicle soon—and that updated rocket will be the one to carry passengers to space. While the company claims it will take on passengers by the end of 2019, it has yet to specify a time frame. Nor has Blue Origin started selling tickets, which unofficial reports claim will cost around $200,000 each. As for the payloads, they are NASA experiments under the Flight Opportunities program, which gives researchers access to a microgravity environment for their experiments. The New Shepard is an ideal vehicle for these tests, since it enters into such an environment for a few minutes during each flight. 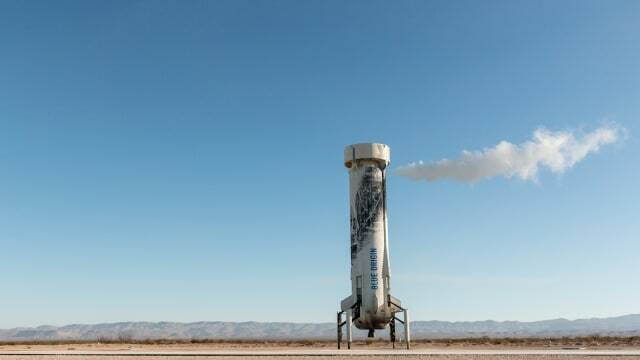 Blue Origin is a supporter of the program; in fact, some of the experiments analyzed the New Shepard’s performance in microgravity, which could help the rocket’s designers make improvements. Find out how Blue Origin is doing against its competitors at Who Will Win the Private Sector Space Race?